We observe daylight savings time here and just recently turned the clocks back an hour. Apparently our dog doesn’t use a clock to tell time. She used to get fed dinner every night at 7:30. Since the time changed she has started to get agitated around 6:40. First she’ll hop around excitedly thinking that the food is about to come. After a few minutes of that when she gets no results she goes into stare down mode. She sits on the very corner of the mat by the front door and stares at Amanda. Somehow this works and she gets fed. It’s weird having an animal actively trying influence your behavior like that. I always thought Daylight Savings Time was backwards. Shouldn’t we be adjusting the clocks so that we have more evening sunlight in the winter, when days are shorter? 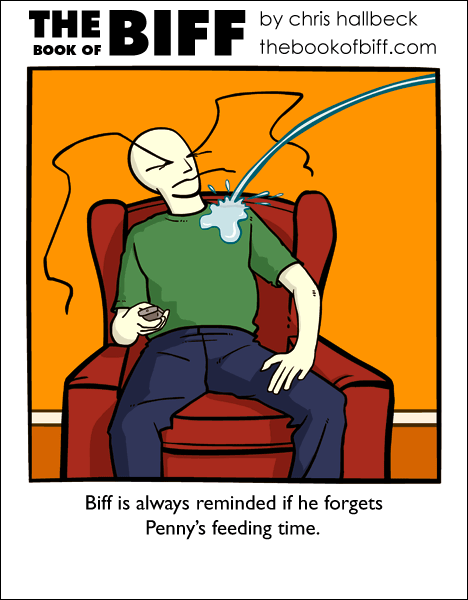 Penny is Biff’s dog I can only assume. I admire it’s … reach there, though Biff clearly should seek the services of a professional dog trainer. no! its a llama!! right? No! It’s a cow! See the milk? No, no, silly, it’s a goldfish. See the water? at the height its coming from id say some sort of giraffe, elephant or dragon. the image along with the name is a bit, well, disturbing. It could be his pet spider, which would explain the size of the spider webs in the attic a few comics ago. I must just have a dirty mind. At least Penney didn’t pee on the remote. heh…my dog is just like that! we force her to wait now though. Winter time is actually “normal time”… Summer is the time that is turned back. Daylight savings time was thought up by Ben Franklin as a way for farmers to get the most out of their day. Since they were early risers, turning the clocks forward during the longer summer hours would allow them to begin work when the sun rose (when the animals woke up). I say Penny is a penny. Or Biff’s pet rock, but most likely a penny. I was assuming penny was a parot….but the other ideas here are…interesting. Or some other kind of bird. I wonder if Penny’s a giant archer fish, or whatever they’re called: The fish that spit at bugs on leaves and grass to knock them into the water. Maybe it’s whatever was in that box. About daylights “savings” time: I’ve always felt that it should be Spring forward, stay the f@$k forward. I HATE normal time, and am in league with the farmers on this (though not the silver standard) that we should abolish it. My dogs like to be fed at 5, and they get agitated starting around 4:30, so when daylight savings ends, and we go back to that abysmal “normal time” they want to get fed at 3:30, when no one is home! It generally takes about a month for them to get used to the fact that we won’t feed them for another hour. Agitated means barking, yipping, snapping, knocking things over, jumping over and on people, and bringing presents such as children’s toys, or office supplies. You got it right, Bronze Dog. They are called archerfish. Dangit, it cut me off. Knowing Biff, that’s probably an actual penny sitting on his desk. My dog has adjusted well to the new time for eating… we’re still working on piddle schedule… having to wake up a hour before I need to actually get out of bed is getting annoying, never can get back to sleep. i invoke the almighty author! Chris! Hear our prayers! Bestoweth unto us the knowledge of what manner of beast this penny is! I’m finally through with the backlog! 2) Making each of those comics one panel so reading through 376 of them at once isnt impossible! Penny is Biff’s pet rock? Maybe. You never know. That thing was big as hell. I just read all of the Biff comics myself. The simple style kind of makes me want to take up comicing again. I won’t because of time constraints, and the fact that I’m neither clever or funny, but it still made me want to do it. In the spirit of Biff, I think Penny is probably his fire hydrant. Hey, Chris showed up and didn’t answer our begging about what Penny is! I guess he wants to keep up suspense? Maybe we were never meant to know? Babies are the same way! My friend’s daughter had to be adjusted to the time change five minutes at a time so she wouldn’t wake up and go to bed too early. Penny is a monkey. Definatly a monkey. actually Franklin proposed DST for the Winter, But I agree with the Spring Forward, and stay there Idea. I’m a bit of a trivia nut myself. The phrase is “Daylight SAVING Time”. We tried year-round DST in 1973—repealed because of the increase in morning school bus accidents. While DST may save on lighting costs, these savings are (possibly more than) balanced by an increase in heating and cooling costs. Basically, there is very little reason to keep DST, and even less to keep switching the time around. We acquired a kitten last week (discovered a stray…hadn’t been stray long.). I wonder how long it’ll take before she has us trained? She obviously has the ability to drag people into sleep with her; what other cat-skills might she have? Or some other Alien creature. If this was a reasonable person, I’d go guppy. They have a habit of jumping up and splashing ya. But… with Biff? I’d guess pirahna or great white shark. It’s clifford the big red dogs sister Penny. she’s green. and rude.